Sablonnières is a village 32 kilometres south east of Meaux. 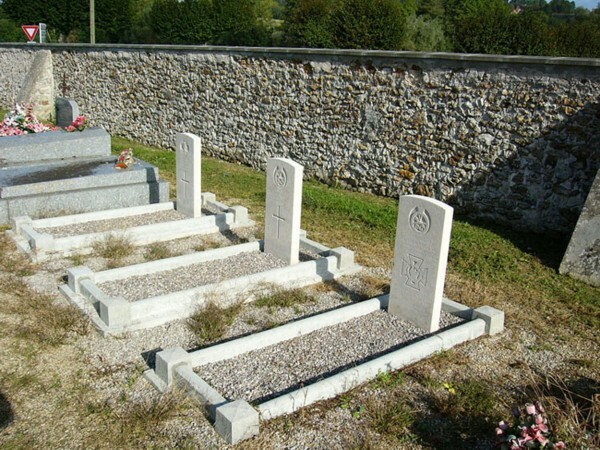 Sablonnières New Communal Cemetery is beside the railway line, west of the village. 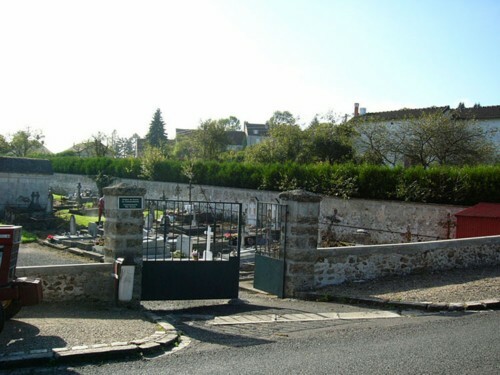 The village of Sablonnières was captured by British troops on 8 September 1914. 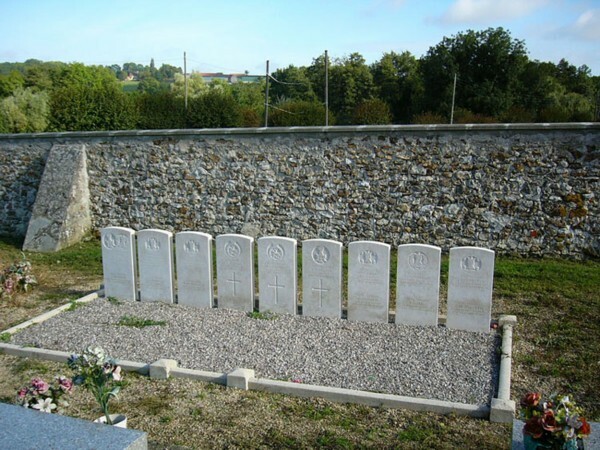 The communal cemetery contains 19 Commonwealth burials of the First World War. L/Cpl. William. ANDERSON, "B" Coy. 1st Bn. Black Watch. Killed in action 8th Sept. 1914, aged 19. Capt. Charles Antoine de Guerry. DALGLISH. Black Watch. Died 8th Sept. 1914. Pte. J. DAVIDSON. 1st Bn. Cameron Highlanders. Died 8th Sept. 1914. Pte. Oliver James FISHLOCK. 5th Dragoon Guards. Died 8th Sept. 1914, aged 19. Pte. R. FORD. 1st Bn. Cameron Highlanders. Died 8th Sept. 1914. Pte. J. FORRESTER. 1st Bn. Black Watch. Died 8th Sept. 1914. Pte. W. McLeod JOHNSTONE. 1st Bn. Black Watch. Died 8th Sept. 1914, aged 34. Capt. Robert Charles PARTRIDGE. 5th Dragoon Guards. Died 8th Sept. 1914, aged 32. Pte. Bert WIDSOM. 5th Dragoon Guards. Killed in action 8th Sept. 1914, aged 27. Son of Walter and Liddia Wisdom; husband of Lilian Widsom of 6 Norton Gardens, Norbury, London. Born at Camberwell, London. 5th Dragoon Guards. Killed in action 8th Sept, 1914, aged 38. Son of Mr. & Mrs. John Norwood; husband of Lilian. 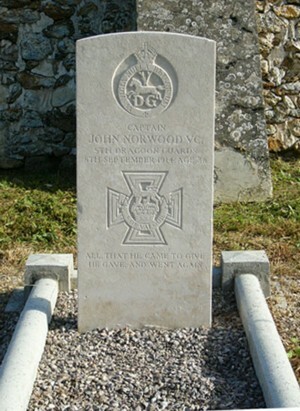 Citation; An extract taken from the London Gazette dated 27th July 1900 records the following: "John Norwood, Lieut. 5th Dragoon Guards. Date of Act of Bravery 30th Oct. 1899. 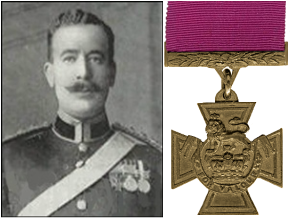 On the 30th Oct. 1899, this officer went out from Ladysmith in charge of a small patrol of the 5th Dragoon Guards. They came under heavy fire from the enemy, who were posted on a ridge in great force. The patrol, which had arrived within about 600 yards of the ridge, then retired a full speed. One man dropped, and Second Lieut. Norwood galloped back about 300 yards through heavy fire, dismounted, and picking up the fallen trooper, carried him out of fire on his back, at the same time leading his horse with one hand. The enemy kept up an incessant fire during the whole time that Second Lieut. Norwood was carrying the man until he was quite out of range"